"Hmmm i wonder where they are. Why is everyone always late to these things"
Raina leaned against the back of the cherry tree in the outside dojo of the 4th Division. It was nice and calming as she looked at the river. After a while she would hear someone speak behind her. Looking up she would see Anju sitting on a branch on the very tree she was leaning on. After hearing her finish her sentence Raina quickly spoke out loud. "How about you look around and you might actually find someone, Anju-Taicho"
"Heh yeah i guess your right. Or maybe you shouldnt hide behind the tree." "Ready when you are Ms. Captain"
Anastasia was running, she did not want to be late for her first spar, side by side with her captain, so she was moving towards the gardened sparring area. She quickly burst through the gate, and stumbled rolling to the ground, landing right at the feet of her captain... She said with a grin, "Sorry I'm late captain." She stood back up, and said, "Nice to meet you Anju-Taicho" As she drew her sword, and readied, herself, she couldn't help but smile. "There you are Ana-san! It great that you finally made it!" 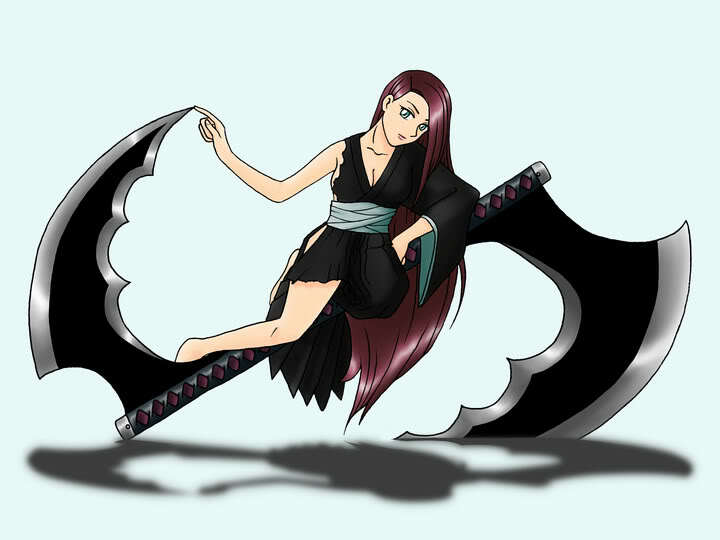 With that said, Raina slowly moved her right hand onto the hilt of her zanpakutou. Gripping it tightly she would smile at Anju. A nice breeze could be felt as she spoke. "Now, shall we begin Anju-Taicho?" "Hello Lieutenant-san and i wont be going easy on you two so be ready. Dance Ryūketsu no ōjo"
"Come on then... im waiting"
Anastasia said, "Wouldn't want it any other way captain!" In what may have been a foolish attack, Anastasia ran directly at Anju, raising her reiatsu to her full power. As she moved in, she feinted left, and then struck at the right side of the captain. Seki (斥, Repulsion) ~ Creates a round shield that seems to temporarily paralyze and repel whatever strikes it. Seeing that the captain had easily read through her feint, and now was attacking with her weapon, Anastasia tried to block the oncoming strike from the scythe, but she wasn't fast enough to block the blow completely. The scythe tore through her dominant shoulder, but was pulled out before it went down too far. She tried to keep her balance, as she shifted her blade from one hand to the other, but she had too much momentum to stop. So she rolled, landing on her good shoulder, and transferring the impact throughout her body. As she came to her feet, she rushed forward, with her blade ready to deflect any blows that came her way. Raina watched as her Lieutenant attacked first. She watched carefully as Anju moved. Seeing her recruit's attack fail and Anju's attack slash Anastasia's shoulder, Raina instantly vanishin a shunpo movement. She would appear right behind her lieutenant, grabbing the back of her shirt collar. Immediately she would vanish in another shunpo appearing right under the pink tree Anju sat on earlier. With a smile she would speak to both Anju and Anastasia before letting go of her shirt. "Let's try this again, shall we?" "Hehe sure we can start over. A piece of advice Lieutenant... When facing someone higher you shouldnt run in. A more distanced attack would be a better way start until you know what i can do. Oh and one more thing..."
"...Never... let your guard down." Anastasia said, "That was foolish of me. Thinking that I could take on a captain who had released, without even revealing my own shi kai." She leveled her sword, and pointed it at Anju, and continued, "Karera no yarikata no machigai o shimesu! Tenpā o nenshō!" Her red and black katana changed into a one handed long sword, with the hilt looking as a dragon with it's wings outstretched. The dragon breathed a flame, that climbed the length of the blade, and then doubled back down the blade, and stretched over her entire body. The shallow wound on her shoulder stopped bleeding, and seemed to slowly fuse together. She lowered her sword, took a defensive stance, and said, "Let's try this again." "I could see her during parts of that insult." She thought, "which means that if she tries anything like that I might be able to block it if I move quickly." Anju passive 3 - Anju's master of shunpo allows her to crate a after image when she uses shunpo. The after image is so realistic it can appear to take damage or even deal a single attack of its own. Raina smirked watching her lieutenant release her zanpakutou. She then turned her sights on Anju. She had never seen her fight before and today was like a bonus to see both her lieutenant's and Anju's shikai. Seeing Anju's afterimage charge towards Anastasia, Raina froze. Even though she saw Anju she could feel her reiatsu else where. Going with her guts she would turn around and swing her zanpakutou in a vertical motion upward. Instantly she would see Anju and smile. "That's a mean trick. You've gotta teach that to me." Immediately she would push forward in a attempt to push Anju back a few feet. Instantly she would moved her right arm forward having the tip of the blade point towards the ground. A second later her reiatsu would become visible as it circled around the base of her feet before taking the outline of a phoenix. Instantly Raina's entire body began to radiate with a purple and black aura. Her black reiatsu would slowly sink back into her body. With another smile she would stare into Anju's eyes. Just before she would make a vertical swing with her zanpakutou releasing a black wave of energy induced with lightning from the blade, she would speak in a casual tone.